Land Products has an enviable reputation for its quality workmanship. 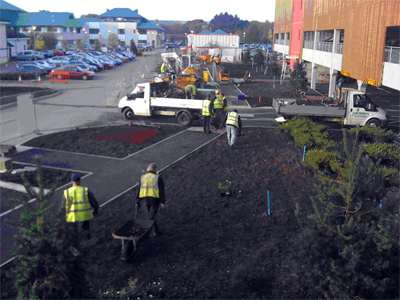 Our experienced teams are able to undertake a variety of soft landscape works in a wide range of sites. As well and the conventional turfing and planting we have completed projects involving bank stabilization, habitat conservation, land reclamation and roof top gardens. We are also able to offer some hard landscaping services such as patio's, decking and water features. All our site operatives hold CSCS cards and we also have staff who hold Construction Site Supervisors Safety Certificates. We offer a reliable and dependable service to our clients and are capable of tackling the smallest to the biggest jobs even in the harshest of conditions.